You want to throw a holiday party but simply cannot afford to spend big bucks in the process. The holidays are full of expenses already without dropping hundreds or even thousands of dollars on festivities. Fortunately, there are plenty of ways to cut down on holiday party costs and still create a great atmosphere. Consider these suggestions to help you party on a budget. Invitations - Keep the invitations as simple as the circumstances will allow. What is appropriate depends on whom you are inviting. If you are throwing an informal party, make your own simple and whimsical paper invitations, or simply save on paper and postage and go completely paperless. If appropriate, consider invitations via e-mail or social media. If paper invitations are a must, consider alternatives such as a postcard that costs less to mail. At the very least, look for sales and clearances on fancier stationery. Food/Drinks - Potluck is the simplest way to keep down costs. Let everybody chip in on the food and drink bill by bringing his or her own dish. You need a signup method or way to assign dishes so you don't end up with 47 bowls of guacamole and no chips. A signup also allows you to supply whatever is missing instead of providing backup for every contingency. If potluck is not appropriate for the occasion, there is no need to go overboard. There are plenty of online resources to help you create your own relatively inexpensive appetizers without having to pay for expensive party trays or catering services. Keep a relatively minimal selection of soft drinks or alcoholic beverages; do not try to fit everybody's taste. Themes can help to narrow the offerings naturally. Going for an island theme? Stick with tropical drinks. Keep plenty of water and non-alcoholic punch or juices on hand for younger guests and designated drivers. Decorations - With the clever use of a theme, you can also keep your decoration expenses down. Themes by definition allow simpler decorations as part of the overall ambiance. Even without a theme, there is nothing wrong with using as much of your available resources as possible before heading to the party supply store. Simple candles and homemade centerpieces can create a nice effect without draining your cash. Even mismatched items can be used to your advantage by creating a theme -- the "red" table vs. the "blue" table, or the "fall" table with pinecones vs. the "spring" table with a simple flower arrangement. Let your imagination loose to make the best of what you have before going out to supplement the décor with extra purchases. Coordinate your decorations with the food and drink plans. For example, it is more appropriate to use paper plates with a series of appetizers or potluck dining than it would be with a more traditional main course and side dishes. Entertainment - If you plan to have entertainment beyond your Uncle Fred singing his favorite classic rock songs after he has had a few too many -- and we suggest that you do -- consider some inexpensive options to a band or a professional DJ. or iHeartRadio, you can program your own channel that matches the tastes of your guests and set up a long enough playlist to get through the evening (and perhaps have it cut off just in time to get rid of that last guest who simply will not take a hint). You can set up the same thing on your computer if that is a more efficient way of handling the music. Depending on the crowd, do not underestimate the power of simple party games like Pictionary or even old-fashioned charades. Again, be sure to assess your guest list to avoid breaking out anything inappropriate for the room. Not everyone is up for holiday Twister. 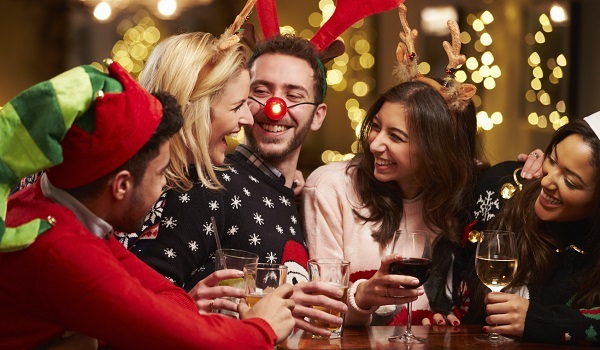 With some advance planning, you can have a great holiday party that everyone will be talking about for years to come, and not because of frequent visits by the police or Uncle Fred's stirring rendition of Aerosmith hits. Dream On, indeed.